Now that we’re without a helper, weekends can be really busy especially when the Husband needs to work. Besides getting house chores and office works done, I’ve to spend quality time with Little Edison. Here are a few suggestions to share with you, from my own experience, on how to have a smooth day with your kids alone. This is mainly for mothers who do not have a helper or do not stay with their parents or in-laws. When I have works to do, I’ll tell him to play on his own and I assure him that I’ll join him in a jiffy when the alarm clock rings. I’ll then set it to 15 or 20 minutes. When the clock rings, I’ll stop my works to play with him. If I planned out some activities for us to do, and if he wants to do something else, I’ll respect that and follow his lead (of course, it must be within the limits!). It’s easier for both of us. 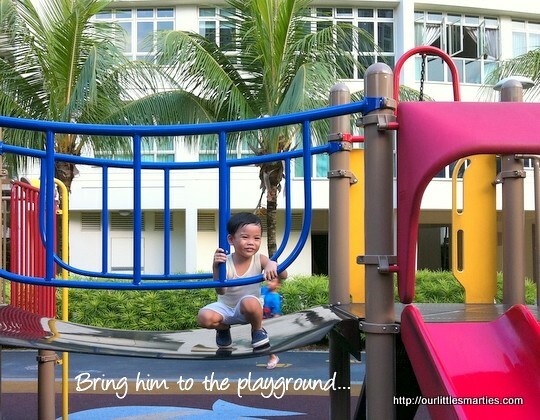 A trip to the park or playground is wonderful for us. 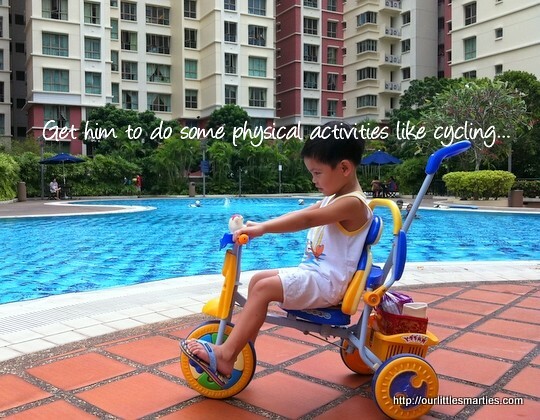 Fresh air, play mates and physical activities that can make him sweat out! When he returns home, he will be hungry and eat without fuss. When he is tired, he will take a longer nap too. I prepare the vegetables or meat – cut, clean, pack them into containers and keep in the fridge the day before. So, it cuts down a lot of preparation time on the day itself. If I’m too lazy, I’ll just dial the magic number 6777 3777. Food will be on the table within an hour (that’s McDelivery!). I can sit and watch with him, or I can sneak away to do some works. But of course, there must be a time limit. If he wants to help out, I’ll let him do it even though he may not be doing it correctly. At least, he is learning. 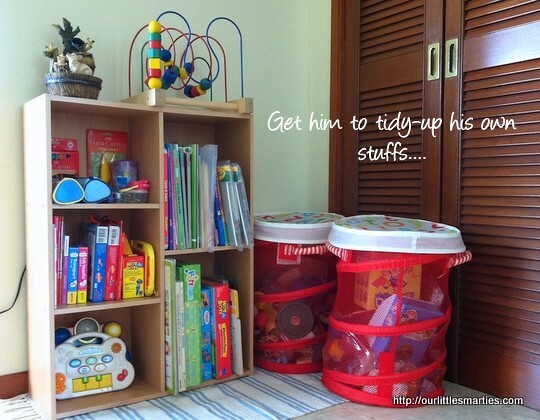 The best place to start is to get him clean up his own toys, book shelf and study table. I don’t want to stay at home all day. So do him. We’ll go out for some shopping, afternoon tea and read some books in the library. Take a bus, if he fancy. He enjoys bus ride. LBL Infant Shoes Giveaway Contest – Winner! mine is a girl, not sure if the following will work for you. but u can involve him in cooking. for a start, give him butter knife to try cutting things like mushrooms, strawberries etc. tell him to rinse veg, rice etc. if u bake, get him involved too. stiring, cracking an egg. it WILL be messy but fun for him. Cooking? Great idea! Maybe he can start with washing first, he sure loves that. And yeah, cracking the egg is fun too. Thanks for your idea! 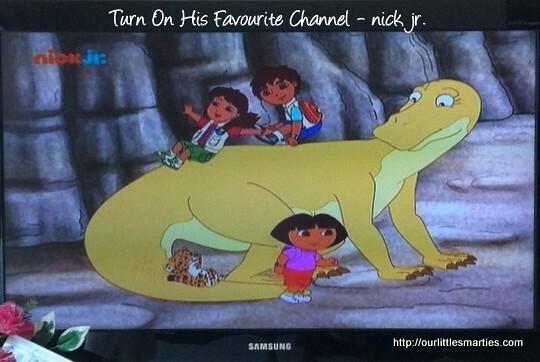 I tried involving the kids in the housework too but as you can imagine, they did more damage than cleaning up! Yeah, more damage than cleaning. I agree. My boy likes to sweep and mop the floor. I let him do it, it’s a good training for him.